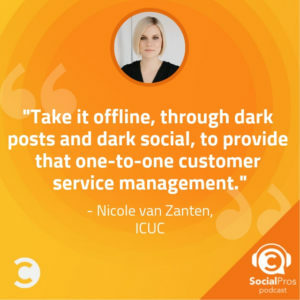 Nicole van Zanten, CRO of ICUC, joins the Social Pros Podcast to discuss the trend toward one-on-one interaction in social media customer service. Social media climates and best practices evolve with dizzying speed. Nowhere is this more true than in the realm of social media customer service, as Nicole van Zanten and the team at ICUC understand all too well. Success metrics have changed. Marketers’ understanding of dark social has evolved. The amount of resources allocated to social teams has increased. Even the level of intimacy users expect from customer care has shifted. It’s all part of a trend toward less public, broadcast-oriented social and more personal, one-on-one social. In this episode, Nicole walks us through the user behaviors contributing to these trends and advice for riding the wave of shifting customer expectations. She also shares examples from the ICUC playbook, including stand-out moments of above-and-beyond social care. 05:18 – How the arena for customer engagement has changed in the past three years. 08:06 – Why more and more brands are strategizing around dark social. 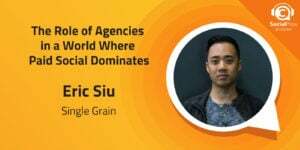 15:25 – How agency-run social media management works for brands in highly regulated industries. 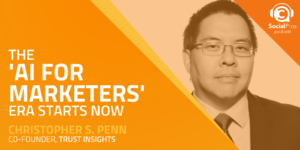 29:32 – The social media success metrics that matter most to brands right now. 06:39 – How ICUC manages around-the-clock social media customer service for brands around the world. 18:26 – A social media customer service victory that touched Nicole’s heart. Stay connected with your email marketing subscribers using Emma. Learn more about how ICUC manages social media customer service. Work hard, and consider saddling yourself to a specific industry. Nicole respects Elon Musk’s ability to innovate and admires his (literally) out-of-this-world ideas. Jay: Hey, it's Jay Baer from Convince & Convert. Welcome to Social Pros. Joined as always by my cohost, the extraordinary man, my special Texas friend from Salesforce Marketing Cloud, it's Adam Brown. And Adam, we jus heard from Nicole van Zanten from ICUC. We do a lot of deep dives on the show, so this show is all about nerding out on social media stuff. And we do that on this episode as well, but boy, talk about simple, solid, timeless advice from Nicole. Adam: It really is. And I think if you listen to our couple of last shows, Jay, this is something that is happening, this idea of remembering that this is about relationships. Remembering that we're seeing Facebook, like announced on March sixth, going to more private conversations, less about the broadcast, more about one on one or small groups. Having that relationship and making your customer feel special and important and heard is so critical, and I think Nicole articulated that in that little brief snippet there. Jay: Well, you know, there's two sides to social. You've got the reactive customer care side and you've got the marketing side. If you can't do the first part right, you probably shouldn't worry about the second part, frankly. And you're exactly right, we're at a point now where I think the pendulum is swinging back the other way and people are saying, "You know what? We have two ears and one mouth for a reason. And maybe we should use that ratio accordingly." Jay: You're going to love this episode of Social Pros with Nicole van Zanten from ICUC. She is super smart and has some great stories about Starbucks, about Kimpton hotels and a lot of other things that you will appreciate. Before we get into the show, quick acknowledgement of our fantastic sponsors without whom we could not bring you the show every single week for nine years, our friends at Salesforce Marketing Cloud. And they've got some terrific new research I want you to download, it's the state of marketing report where Salesforce went out and interviewed 4,100 marketers from around the globe, I'd say a pretty strong data set, and brought to the forefront a ton of interesting conclusions about where marketing is headed, really where it is today, the role of CX in marketing, the changing role of social, which we actually talk about here on this episode, how critical AI is in 2019, which is certainly a topic we've touched on here recently on Social Pros. Adam: My city. My hometown. Jay: If you're going to have a company and a headquarters, Nashville would be right up there with Austin on the top of my list. They're a super great group, we love the folks down there. If you're thinking about sending more email, better email, different email, give them a shot. Go to myemma.com. That's M-Y Emma.com. Jay: All right, here we go, Nicole van Zanten from ICUC, this week on Social Pros. 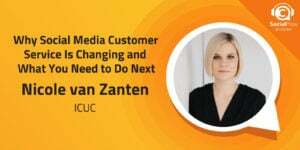 Nicole van Zanten, chief officer for ICUC is our guest this week on Social Pros. Nicole, thanks so much for being here. How are you? Nicole: I'm great, how are you? Jay: I'm leaving the dream. Jay: As Mr. Brown is also living the dream. We've talked about you on the show in the past because ICUC has been a sponsor of this program at one point. Why don't you, just in case though, describe the scope of services that ICUC provides before we ask you a bunch of hard questions? Nicole: Oh my gosh, yes, absolutely. So ICUC, we are a global social media management agency. So we are essentially the eyes and ears and the managers of brands that we all know and love. We are here when brands need additional support, nights, weekends supports, and we work in a variety of capacities with brands that are small-medium to enterprise size. Jay: Do you tend to do more social media marketing or social care, or both? Nicole: Social care. So one to one customer service is a really popular service of ours, especially over the last year. Customer service through direct messages to right on the feats of brands on Twitter, Facebook, Instagram, and otherwise. Jay: So important. In fact, you and I were doing a webinar together about that whole idea of dark service. We talk about dark social a lot on this show and elsewhere, where you've got social posts that really are only seen because they're ads on our newsfeed, and that's happened a lot more in customer service now, right? When I wrote "Hug your haters" two, three years ago, so much of the social care world was public Tweets, public Facebook posts, public Instagram messages, and now we're seeing a lot more interaction between brands and customers in Messenger or DMs, things like that. Does that change the way you go about handling customers in these places? Nicole: Absolutely. The way that you engage the customer one on one via through direct message, you can engage in a much more, as you know, personal and a private way, really. You can have those conversations, be it positive, neutral, or negative conversations, through direct message in a much easier way than you can through posts or Tweets on a live feed. So as much as we can, we always encourage our brands to engage in a feed in a public setting, but take it off line, we like to say, through dark posts and dark social, just to provide that one to one customer service management. So we do that all day every day, and as you can see, we're really jazzed about it. Jay: Well, and of course in a regular industry, you almost have to go that route, right? Because you can't put an account number out there, you can't diagnose somebody's health issues or what have you. Jay: You mentioned when you started nights and weekends support, that kind of thing, does that tend to be where ICUC gets involved, where the company might handle the regular eight to six kind of hours, but it's harder for them to staff nights and weekends so they use ICUC and your team for that window of time? Or do you tend to do all of it and just say, "Look, we're just going to be your social care team"? Nicole: It completely depends on the client. In my history, eight years ago I was a social media manager for an NHL club, and I was working what felt like 24/7 at the time and it's so easy for social managers to get burnt out. So ICUC is here if that social manager, heaven forbid, wants to take a night off or take a vacation, right? Nicole: No, we do work in varying capacities depending on the client. Adam: Nicole, it's so great to have you on the show. I think a lot of your firm and what you do. I'm curious, one question, you mentioned some of the services that you provide in the open, whether it's moderation, whether it's content creation, whether it's social customer care. So many different things, but I truly believe that your firm, like a lot of agencies, is kind of the bell weather for where our industry is going. So my question to you is this, what is the one or two things that you're seeing an increase in in terms of the volume of business and the request from your customers? It's your one area that is growing that social media professionals like our listeners are needing support or assistance with. Nicole: Awesome, great question. So one of the challenges that we're tackling as a business right now is understanding what goes on in dark social, and I know that we talked about dark social for years. It feels like it's that topic that just keeps on bubbling up. But in actuality, a lot of our clients are taking strategic social strategy to dark social, and through that we are engaging through paid posts, DMs as I mentioned, but really through that paid post opportunity. So we're working with clients via retail or pharmaceutical or restaurants who are strategically providing very targeted posts, be it location, interest, or otherwise, and working through not only that strategy but how you engage in a dark manner versus in a public setting. If that makes sense. So this is absolutely a challenge and an opportunity for us. Just as social is changing so quickly, of course, we are staying on top of it and doing our best to stay on top of it, but we're navigating the social landscape just like everybody else is. So this is certainly a challenge that we're facing this year. Adam: Nicole, I'm curious, as we record this on March sixth, Mark Zuckerberg was just interviewed in link to a post on the Wall Street Journal, and he talked about a shift that he sees in Facebook and I'm curious how this is going to impact your business and quite frankly everybody who's probably listening to the podcast. The synopsis of what he talked about was that Facebook will increasingly shift its focus away from public post to encrypted, ephemeral communications on its top messaging apps. So less on the feed, more on the chat, more on the messaging. And I'm curious how you see that shifting. Jay: And stories, I would say, too. Adam: Very much so, very much so, Jay. I'm curious how you see that perspective. Nicole: Well, I believe we have seen this shift led by users, really, so we've seen the shift move to DM. I can count the number of conversations that I have on Instagram direct messenger with my friends versus the number of actual posts that I actually create, right? I would say 90% of my time personally is spent in Instagram direct messenger, and the same can be said for our clients. We're using that one to one customer engagement through messenger services, like direct message on Instagram, on Twitter DM, moving into WhatsApp. I'm really excited about that, where we're trying to understand how we can help brands move their customer service to a platform like WhatsApp. So in my mind, the social users are really driving that change, which is exciting to see it not necessarily led by the business itself, but understanding data that the users are generating and making decisions based on that data. Jay: That we are going, his prediction is that we're going to move from the broadcasting model of social back to the phone book model, which is sort of how it originally was, right? More of a texting, I'm going to communicate to you or to you and Nicole or two or three people, and that the technology would shift that way partially because of privacy concerns and partially because his prediction was that millennials and Gen-Z are not as interested in broadcasting out to tons of people at once just as a personality marker, and that everything would kind of move back into dark messaging. And I think he ended up being right on the money, or so it appears. Nicole: Absolutely. I absolutely, I go back and like I said, my example with the amount of time that I spend in more or less that dark space versus actually posting on feeds, and I do feel that there's a fine balance with brands when it comes to posting rather on the public feed versus the dark opportunities that are there versus the one to one customer engagement, right? So if you do have a brand and you hop on their page, their Facebook page, let's say, their Instagram page, and you haven't seen a post in six months, that's a problem. You don't know what's happening behind the scenes when it comes to dark. They might very well have a great entrenched strategy when it comes to dark social, but it is still of course important to have that public facing not necessarily be primary, but active. Jay: Are you doing stories and actually answering questions somebody might post in stories and handling that on behalf of your clients as well? Nicole: Yeah, we do that with Starbucks, which is really exciting. So Starbucks was one of our first clients who really hopped onboard the stories train. Very interesting for us, as I'm sure you can imagine in terms of the backend work, right, where APIs and I can go down the API train 'til the cows come home, but it's been a unique opportunity for us to work with Instagram and understand what kind of APIs are available. They are very private when it comes to APIs, so our humans really are on their phones and engaging on behalf of our brands, which is exciting when it comes to Instagram stories but I think there's a lot of work that needs to be done when you work with the networks and of course a strategy from the client perspective. Jay: Yeah, it's hilarious, right? Like okay, this is a giant global brand. You are their representative in what, according to today's report from Edison Research, is the only social network that is growing in the United States, and you're managing it on somebody's phone. Jay: Like, come on, guys. Let's get it together here. Jay: It's a little half-assed to me, because it's 2019. Nicole: I know, we're trying our best. 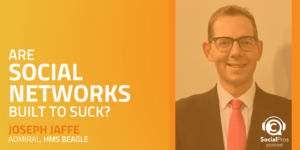 We're trying our best to work through and navigate all of those challenges, but I think that's what's really exciting for me when it comes to social is Jay, I'm sure you can appreciate, 10 years ago that was not even a second thought. You hop on your phone, you engage. And now there's so many business decisions and corporate decisions that have to go into the little device, right? So the world has shifted so significantly. Jay: I blame Adam and Salesforce. Adam: We do our best. I am curious, Nicole, though, you mentioned obviously how this entire business the three of us have been in has changed over the past 10 years, and it has gone from us just sitting at a Tweet, I can remember responding to a Tweet from Ad Coca Cola on my iPhone, probably sitting at dinner somewhere. And now as you said, there's committees, there's testing, and there's all these types of things. I think our listeners would be fascinated in the process by which you create new content and get that to market, and whether it's for Starbucks or for one of your other large accounts. What does that process look like from bringing in your creative professionals to come up with an idea for content, determining whether that content is appropriate using measurement and analytics, getting that content out there, getting it approved, the moderation on the backend, and then coming back with a nice report with a bow on it and showing your client yes, this was successful, or no, this wasn't as successful as we'd like, but here's what we're gonna do to make it different? Adam: What does that look like in an agency like ICUC? Nicole: It is so highly dependent on not only the client, but the industry. So when we work with pharmaceutical companies, it can take six months to get something created. But that is something their process and their due diligence, right? So we work with, when it comes to pharmaceutical, we work with adverse events focused. So adverse events are if you're taking a drug or a pill and someone's having an adverse effect and they post on social media, it's up to us to escalate that content, right? So that's a very clearly defined process. Adam: So someone took some Tums and said, "I'm seeing hallucinations," even if they said it in a joke, it doesn't matter. You've got to report that as an adverse event? Nicole: We have to document it and we have to report it, and at the end of the year we could be audited on behalf of the brand. So social media, again, going back to eight, nine, 10 years ago, so significantly different. So that's when it comes to more regulated industries like pharmaceutical. Very clear direction on content, but it goes through many layers of approval for content. Now, I'm really excited about some of our work, especially with restaurants and hotel hospitality chains. So we do some remarkable work with IHG, and with them we are so well entrenched and ingrained in their company and within their team that we can really respond with our voice. So we can respond with our approval, which I think is so fantastic and it's a lot of hard work and partnership and collaboration. So like I said, it's just so different depending on the industry, but very proud of our team for having the ability and the experience to work with such industries. Jay: ... has a lot of loyal customers. One of the things that I wanted to ask you about, Nicole, and Nicole van Zanten, who's a chief revenue officer for ICUC, is the guest this week of Adam and I on Social Pros, and Nicole, a lot of times in the hotel biz, people kind of do the surprise and delight game, right? Like hey, this customer would really like it if we brought them a cheesecake or whatever the circumstances are. Are you, as the representative, as the voice of Kimpton in social, are you allowed to do that? If you and your team are like, "Hey, we could do something really special for this guest," do you then communicate that to the ops people at the individual hotel and then they execute it? How does that work and what sort of guidelines do they have for you in terms of what you can and cannot do in that regard? Nicole: Good question. So I can walk you through something that happened just a few months ago, and I promise I won't cry, but I have a dog and this has to do with a dog, so it just makes me get that little warm fuzzy. Jay: All right, ladies and gentleman, you've been warned by Nicole that this next part of the podcast may be emotional. Nicole: So our work with Kimpton is exciting. So we are entrenched not only in their social channels and their social strategy, but within their email strategy, their email customer service. So we have access to their CRM, which means that if we spot something on social, we can connect with the Kimpton in Los Angeles or the Kimpton in New York and see who's on desk that evening and give them a call if there's something that's going on in their hotel. So there's a really heart-warming story about three months ago. There was a convention, a police officer convention, at a Kimpton hotel, and one of the police officers said she was going to hop upstairs and just finish reading her book about this really beautiful police dog that saved a life. And so she Tweeted that, she hopped upstairs, she just finished reading her book, and she said, "Oh, this was really emotional, but really glad to be in this warm hotel. It's a great area, great opportunity for me to finish my book because I have this time," and etc., etc. And then she did tag Kimpton and also gave her location. So our people hopped in the CRM, took a look at who was on the front desk that day, gave them a ring, and said, "This police officer is up in her room. Why don't you give her a little care package of Kleenex or chocolates or whatever it might be?" And so the team did just that. They brought up some Kleenex to her room and then she Tweeted how thankful she was for Kimpton, and the author of the book picked up on that Tweet and it just turned into a really, really heartwarming story. So those are the situations that we're able to provide with Kimpton. It's not that big Oreo dunk in the dark moment that every single brand seems to want to replicate year over year. No, we're not spending the millions of dollars making those little surprise and delights happen, but they happen every single day and I think that's very meaningful and very exciting for that brand. Adam: I love that story. And I'm sure Jay does too, because I think it's the emblematic of the shift at least that I'm seeing, from my perspective at Salesforce, and that is from posts to people. That it's now becoming more about the person behind the post than the post itself, but you can't do any of this until you can connect that AdamCB on Twitter is Adam Brown who's staying in the hotel tonight and the customer service or the front desk or the guest support people who can actually then surprise and delight the customer. Adam: My question for you, Nicole, is how are you seeing those things converging? You couldn't do what you're doing if Kimpton didn't trust you enough to give you access to their CRM. Are you seeing other companies and customers doing that? Is anybody wrestling with how do we let our agency get into our business business, of actually the CRM? Nicole: Yeah, absolutely. So we strategically placed a crawl, walk, run approach, which is not new for businesses, but for us it works out really well. So we can partner with a brand and that's not going to happen on day one, simply because we haven't built that trust and that partnership. As best as we can with our account managers and our customers' access directors, yes, we can surprise and delight them during our sales process, but we don't expect that everyone's going to have that confidence and trust in us until we can actually prove our work. So we usually start off with some very basic next weekend crawl, walk, run approach, so that would be the crawl. The walk is that full-time customer service management, the extension of your team, and then at that point that is when we can really provide that holistic customer journey all in one solution. So by no means do we expect that our clients are going to give us access to their CRM right off the bat. I wouldn't give access to a CRM right off the bat. It really does take that trust. Jay: Nicole, one thing you mentioned in your Kimpton example was that the guest had fortunately tagged Kimpton in their post. As we all know, a lot of times that doesn't happen, that guests, especially now in a more stories-based environment, will shoot a picture, will post it up to their friends or post it on their story, and not take the time to look up or tag the brand, which then gives you less raw materials. One of our previous sponsors on the show was Hyper, who's a software package and gives you that ability to find stuff that isn't tagged. Do you at ICUC use technology like that to be able to pull some of that additional customer comments out of the social media woodwork that maybe aren't explicitly tagged? Nicole: I love Hyper, and so I'm really excited that we've had a chance to really take a look at their platform. So we take that holistic approach to tech, so we use everything from Crimson Hexagon to our own Hen House software, all of that jazz historically back in the day. So we use a variety of tools and technology to make that happen. Now it really does depend on platform and what sort of API we can gain access from on the platform. So with Instagram, it's pretty easy to see the location even if they don't tag the brand. With Twitter, it was interesting, I was just on a call a couple of days ago, an update call on their API, and they've recommended to brands that they no longer engage or social listen to anything that does not mention their unique brand for privacy and safety reasons. Now, strategically you can take that one of two ways, right? You can look at just brand mentions, or you can say, "You know what, that's actually a missed opportunity." So I'm very interested to see what happens with Twitter in regards to their API and their access. It really does depend on the platform and where you decide to engage strategically as a brand. Jay: Yeah, that's a really interesting perspective, that idea that we're pretty sure they're talking to us, but we don't know for positive they're talking to us, so we're just going to ignore it 'cause we're not positive. I don't know, that's a difficult strategic quandary, for sure. Nicole: It is, it is. And I was just talking with a couple of my account managers yesterday and we were chatting about how we insert ourselves into conversations for a couple of our clients, and they were sharing, they were like, "You know what, Nicole? It just doesn't feel natural when we hop into the conversation when they don't actually directly mention us." And I said, "Totally fair." And it really does depend on the situation at hand and it depends on the brand, too. Adam: And I think, Nicole, that's a dilemma I think we all, as social media professionals, have. And I'm curious more as we flip to a little more HR, relating to ICUC, because the skills it takes for someone to make that decision, and typically that's not gonna be the social media leader unless you're at a very small organization that is gonna be sitting there, see something hit the feed. Maybe they're talking about me, I'm 99.5% sure, but I'm not 100% sure. Those are the types of decisions that a practitioner, a customer service or social media response agent or team member, is going to have to make. I'm curious, Nicole, how is this changing the people that you're hiring? How is this changing your approach to who you have there at 2:00 in the morning being that sole individual contributor who is making those types of decisions on behalf of huge brands, like you said, Kimpton and Starbucks? Nicole: Yeah, that's a great question. We're going through an evolution of this right now because historically, we were this moderation company, right? So it was very easy to approve and reject content. And now, every single client that we bring on board has to have that strategic insight of that strategic team. So we've built ourselves up in a way where we have different pods. We have a pod that's dedicated to, let's say, five clients, and within that they have account managers, they have contract specialists. You have a team of people where if you are making those tough decisions at two in the morning, our operations team is amazing. So they've strategically ensured that they have somebody, be it in the UK or somebody who's working in overnight shifts in Canada or the U.S., to bounce ideas off one another. Nicole: So there's never one person making that decision. There's always a minimum of two, which I think is really great. There's some big decisions that I'm sure the three of us make respectively, and it's really difficult to do in a silo, especially when you're working with a client. So we always ensure that we have a minimum of two people making some of those bigger decisions. Adam: Great. And I think that's one of the benefits an agency like yours can provide, because typically a brand can't do that. They can't do the 24/7, 365 and have that depth of people that are looking at something. Adam: Nicole, I know one of your other services you provide is around UGC, and the approval process and the cues of that. We've seen user generated content blossom, explode, in terms of popularity because of what Jay and I still often talk about, in terms of authenticity and genuineness and things like that. How does that process work, and especially for many of the regulated agencies that you're in, whether it be pharma or banking? Is UGC at a crossroads? Is it still getting the level of engagement, more than just a traditional post? Nicole: It is. It is, across the board, it is. So if you hop on Starbucks' Instagram, for example, Starbucks really uses almost 100% UGC on their Instagram feed because they want to share and celebrate with the community that they have. When it comes to regulated industries, and even with Starbucks, we work strategically with Starbucks on this process is if our team sees a piece of user-generated content that they would like to have shared on Twitter, Instagram, Facebook, whatever the network might be, we develop a unique form for each business. And so we have to ensure that within that form, there is some contact information for this person and they have verbally agreed, either through verbally, text, or post agreed, either through Twitter or an Instagram comment or a Facebook direct message. So we are tracking all of that because at the end of the day, if you're using a piece of my content that I've taken and I haven't given Starbucks approval and it's utilized in a sponsored post, let's say, that doesn't feel great as part of the community. So we always ensure that we work with the user at the end to give us that permission. Jay: Nicole, because of the rise of stories and dark service and even new platforms that really wouldn't have been used in a service capacity in years past, how has your reporting or your success metrics changed? The data that you collect to measure effectiveness and that you then pass along to your clients, I imagine an ICUC results dashboard today looks quite a bit different than ICUC results dashboard from three years ago. Can you talk us through a little bit how that has been modified? Jay: Spoken like a proud Canadian, thank you for slipping that in there. Nicole: We were really not focused on revenue that we could generate through social simply because it was a network that they were using that we were using to test and it was a lever that we could pull to see back in my days with the NHL club I worked with, to see if we could engage with fans and potentially sell some tickets. But we've come through now where clients are always focused on are we driving traffic to their website, are we increasing the number of engaged fans, no longer the vanity metrics, but engaged fans, and for clients where we can actually tie ROI, what's the ROI that's being generated through our partnership? Jay: So something like Kimpton, I think you could manage and say, "Okay, we interact with these people, they book room nights, etc., etc." But in a Starbucks situation, people aren't necessarily buying coffee online with great regularity. So how do you run a revenue calculation on a program like that? Nicole: Yeah, so we can look at driving customers to stores through various campaigns, on your phone, on the mobile app, we can actually track who's using the mobile app, which users on Twitter, Facebook, and Instagram, let's say, are they increasing the use in their Starbucks cards through their mobile app? So if we have that data, and of course that is a five, six, seven year partnership where we develop that trust, that is where we can actually tie that ROI. But traffic is such an interesting KPI to track and target, and it really does differ depending on the client that we're working with. But if there is a mobile app, if there's any sort of trackable length that we can measure, that's when we can really see those metrics. Adam: Nicole van Zanten, chief revenue officer of ICUC at ICUC.social, so great to have you on the show. I think if we had a sub headline for this show, it's really about evolution, because we're seeing all these changes and you just articulated that ROI change, is ROIs have gotten easier for us to track, social media budgets have gotten larger. One of the questions I have is how is that changing your customer? So the client that you are actually interacting with. Adam: I'm curious on two things: are you seeing that social media decision-maker who's bringing an agency like ICUC in more seasoned? Are we going from a director to a VP to a senior vice president or the CMO? And secondly, where is their home room? Is it still typically in the marketing department, customer service? Curious what shifts you're seeing at your level. Nicole: Yes, to see titles of our decision-makers and just to take a bit of a deep dive in has it changed over the last few months? Because we work in a very quick, fast-paced cycle. So that decision-maker could change in Q3 of last year versus what we're coming up to Q2 of this year. We are seeing social land in the communications departments. So back in the day, five years ago, when I started at ICUC, it was marketing. Through and through. Social media was in the marketing department. They were saddled up with marketing, not necessarily business development, but it was a really thorough marketing strategic move through social. Now we're just, as I said, we're seeing communications across the board, PR and communications. I think, and this is just a gut feeling, I hate making decisions based on gut feelings because I'm a real data-driven individual. I think it's because the number of crisis situations that we're seeing in social. So if you're working with an airline industry, there's arguably a crisis happening, be it oversold seats or heaven forbid, a plane that's one the ground for two hours too long due to a delay, and we're seeing a crisis situation happening all the time. So these social media managers, these social media directors, are landing within the communications department. So that answers that second question. If I go back to the first question, the evolution of the decision-maker and really the evolution of our day to day, I feel like social was stuck within this coordinator level for so long. There were social media coordinators part-time, which I can't even begin to wrap my head around how this is a part-time job, but social media coordinators on a part-time level. Now we're seeing social directors and VPs of social across companies like Coca Cola has a VP of social media, which I think is just tremendous, right? It's really breaking down those walls and those barriers and having a seat at that table, being a decision-maker. Jay: Should've stayed around Coke, you could've been a VP. Adam: I think it's so true. 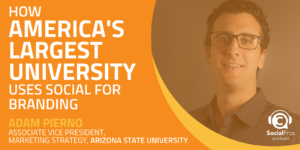 And I think it's great news for all of our listeners, because this means we have this opportunity to matriculate in our organizations or matriculate to other organizations as we see budgets for social media go from seven or eight percent of a CMO's budget to 30, 40, 50% and more, and that's just the marketing people. And as you said, the communications, the PR team, the issues crisis communications team, the customer service team. I'm curious, last question for me and I'll pass it back to Jay, the chief digital officer is a role we saw being created five, six years ago that was supposedly going to be that ombudsman, that person that sits between all these different departments and can wrangle this. Are you seeing that chief digital officer as a position that has legs or is the power and the control going back to the CMO chief communications officer, chief customer officer? Nicole: For me, I do see it within the chief customer officer. I think customer experience is where a number of platforms lie, be it through social, be it through email, be it through chat bot, which is, I know we didn't talk about chat bots, but the advent of chat bots through Facebook. And then 1-800 numbers are still, of course, very relevant, if you want to talk to an actual human, which seems like it's happening far and far less these days. But I do see the value in having that chief customer officer where you can really wrap your arms around a number of platforms, not necessarily regulated or restricted rather to social exclusively. So although that might be a career trajectory path for someone in the social manager position, I encourage you to think outside the box and how can you experience or how can you impact the customer experience across all aspects of the customer journey, not just social? Jay: That's well said. Last question I wanted to ask you before I get into the final wrap up here is, you're in the business of dealing with people who may not be super happy all the time, and sort of being that first line of defense, I imagine when ICUC people gather around the water cooler or the bar or the nacho station or whatever, there are all these stories about this one time, I had a customer who was so mad and we did this crazy thing and you've been there for a really long time. What is the ultimate ICUC story that you can share with Social Pros listeners? The one time there was this crazy customer disaster and you guys came in and saved the day? Nicole: Oh my gosh. It's so funny because I feel like taking anything, I don't think there's just one story, but if you take something offline, people change like this. Unbelievably so. If you take a conversation off a public Twitter timeline, let's say, and bring it to direct messenger and just listen to someone, and I would say that would be my one piece of advice, just listen to someone. Because at the end of the day, if they're on a delayed flight, for example, they just need to rant. There's nothing that we can do to make sure their plane leaves on time. What we can do is listen. And we always recommend if clients do have the budget to do so, spend a little something, be it a $10 stuffed animal that's like an Air Canada stuffed animal, or whatever that looks like for your business or your brand, right? A little bit goes a long way. Don't be afraid to give a hand-written note. These are very simple things that can make such a significant impact. So I think that's more of a broad recommendation for anyone who's dealing with a crisis situation. Nicole: It's not fun. We all know it's not a fun situation to be in. But a lot of times, they just need someone to listen to them. Jay: The customer is not always right, but the customer should always be heard. Nicole, what one tip would you give somebody who's looking to become a social pro? Nicole: Work hard. Work hard is the number one step I would say. If you can saddle yourself up in a specific industry, that goes a long way. So for example, at ICUC we have a pharmaceutical team entirely responsible to pharmaceutical clients that we have right now and pharmaceutical clients that we will have in the future. And the experience that you can gather within an industry, and be it pharmaceutical, be it regulated, be it retail, restaurant, can go a long, long way because that makes you, gives you a different opportunity or a different set of skills versus somebody else, who's working to be that social pro. Jay: That's a really, really smart answer, is that category definition and focus. In fact, my daughter is in university right now and is a social media, a budding social pro, and she and I talk about that all the time. She's working on picking internships and things like that, it's like, "Okay, well, what industry do you want to work in? Let's focus there, which gives you a better outcome," and actually hospitality, so maybe we'll call about Kimpton one of these days. Jay: Last question for Nicole van Zanten, chief revenue officer for ICUC. Nicole, thanks so much for being here. You were terrific. If you could do a video call with any living person, who would it be and why? Nicole: Elon Musk. Controversial topic or controversial individual. Jay: Not usually, didn't used to be controversial. Now it is, more so now. Nicole: The reason why his ability to innovate and just his big-time thinking is something that I really respect and appreciate, no matter how out of this world, literally, his ideas are. I just really appreciate that ability to be an innovator and an influencer. Jay: Also somebody who could probably use some help from ICUC in his use of social media, so possibly a future client, might need a little filter there, so it appears. Jay: Well, Adam and I are both Tesla drivers, so we are in your corner. Nicole: I'm with you, yes. Jay: On the Elon Musk. Absolutely. Nicole, thanks again for being here. Congratulations on all the work and the success at ICUC. We'll have you back on the show sometime and talk about some new stories, stories from the front lines out there. Nicole: Absolutely. Thank you so much for having me. Jay: You bet. Friends, you can find all of Nicole's info on the company ICUC.social, that's ICUC.social. You can get this this recording, the transcript, links on socialpros.com, not just this episode but every single episode we've done going back now nine years. Nine years, Adam. Nine years. Adam: Wow. Seems like yesterday. Jay: A lot of podcasts, ladies and gentlemen. And as I mentioned, a week or so ago, just a reminder that you can now get the show all the places that you can get shows like this. So on Anchor, on Spotify, all the different platforms you can find Social Pros, so do that as well. Leave us a review. We'd be super psyched about that. We'll answer your questions, too. You can send us a note at Jbaer.com, and Adam and I will be right back in touch. Next week on the Social Pros podcast will be more fantastic goodness. I don't have the list of guests in front of me so I can't tease the show, which is poor hosting etiquette, but don't worry, it's gonna be good. It's gonna be fantastic. On behalf of Adam Brown from Salesforce Marketing Cloud, I'm Jay Baer from Convince and Convert. This has been your favorite podcast in the whole world, I hope. This has been Social Pros.